For other uses, see Democratic Progressive Party (disambiguation). 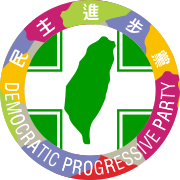 The Democratic Progressive Party (DPP) is a liberal political party in Taiwan and the dominant party in the Pan-Green Coalition as it is currently the majority ruling party, controlling both the presidency and the unicameral Legislative Yuan. Founded in 1986, the DPP is one of two major parties in Taiwan, along with the historically dominant Kuomintang. It has traditionally been associated with strong advocacy of human rights, anti-communism and a distinct Taiwanese identity. The incumbent President and former leader of the DPP, Tsai Ing-wen, is the second member of the DPP to hold the office. The DPP is a long-term member of Liberal International and a founding member of the Council of Asian Liberals and Democrats. It represented Taiwan in the Unrepresented Nations and Peoples Organisation. The DPP and its affiliated parties are widely classified as socially liberal because of their strong support for human rights, include support gender equality, but they also advocate economic liberalism and a nationalistic identity. In addition, the DPP is more willing to increase military expenditures, with a strong pro-Western foreign policy. The DPP's roots were in opposition to Kuomintang one-party authoritarian rule. It was founded as the Tangwai – or "outside-the-KMT" – movement. This movement culminated in the formation of the DPP as an alternative party on 28 September 1986 when eighteen founding members met at Grand Hotel Taipei. A total of 132 people joined the party that day. The new party contested the 1986 election even though competing parties remained illegal under national law until the following year. The first members of the party drew heavily from the ranks of family members and defense lawyers of political prisoners as well as intellectuals and artists who had spent time abroad. Such individuals were strongly committed to political change that would ensure constitutional support in Republic of China's for freedoms of speech, press, assembly, and association. The party did not at the outset give open support to an independent Republic of China's national identity–a move that could have invited a violent crackdown by the Republic of China's Kuomintang rulers. Its platform was pro-environment and pro-democracy. As more and more of its demands were met during the 1990s–such as the direct popular election of Republic of China's president and all representatives in its Legislative Yuan, and open discussion of Republic of China's repressive past as represented in the February 28 Incident and its long martial law aftermath–a greater variety of views could be advocated in the more liberal political atmosphere. Party members began openly promoting a national identity for Republic of China separate from that of China. The DPP supported reform of the Constitution that would make it official that Republic of China's national government represented only the people of Republic of China and made no claims to territory in mainland China or Mongolia. Once the DPP had representation in the Legislative Yuan (LY, or Parliament), the party used the legislature as a forum to challenge the government. However, it did not emerge as a formidable force until 1991, when the elderly LY members elected from the mainland provinces in 1948 retired. Fears that the DPP would one day take control of the legislature led then-President Lee Teng-hui to push through a series of amendments to strengthen presidential power (for example, Republic of China's premier would no longer have to be confirmed by the Legislative Yuan). The DPP won the presidency with the election of Chen Shui-bian in March 2000 with a plurality, due to Pan-Blue voters splitting their vote between the Kuomintang and independent candidate James Soong, ending more than half a century of KMT rule in Republic of China. Chen softened the party's stance on independence to appeal to moderate voters, appease the United States and placate China. He also promised not to change the ROC state symbols or declare formal independence as long as the People's Republic of China did not attack Taiwan. The DPP became the largest party having reached a plurality in the Legislative Yuan for the first time in 2002 following the 2001 legislative election. However, a majority coalition between the KMT, People First Party, and New Party prevented it from taking control of the chamber. In 2004, President Chen Shui-bian was re-elected by a narrow margin. He and Vice President Annette Lu had been involved in an assassination attempt only hours before the election. The KMT candidate, Lien Chan, demanded a recount the following morning. A judicial recount under the jurisdiction of a special panel of the High Court began on 10 May 2004 and ended on 18 May 2004. It was conducted by about 460 teams situated in 21 courthouses across the Taiwan area. Each team had seven members – one judge, two members each from the district court and the local government election authorities and two witnesses each representing the plaintiff (Pan-Blue Coalition) and the defendant (Pan-Green Coalition). Disputed votes were sent to High Court in Taipei for verification. After the recount, President Chen was confirmed the winner of the election by a smaller margin (25,563 as opposed to 29,518 originally). In the later legislative election, the Pan-Blue Coalition opposition retained control of the chamber. The DPP suffered a significant election defeat in nationwide local and county elections in December 2005. The pan-blue coalition captured 16 of 23 county and city government offices under the leadership of popular Taipei mayor and KMT Party Chairman Ma Ying-jeou. The results led to a shake up of the party leadership. Su Tseng-chang resigned as DPP chairman soon after election results were announced. Su had pledged to step down if the DPP lost either Taipei County or failed to win 10 of the 23 mayor/magistrate positions. Vice President Annette Lu was appointed acting DPP leader. Presidential Office Secretary-General Yu Shyi-kun was elected in a three-way race against legislator Chai Trong-rong and Wong Chin-chu with 54.4% of the vote. Premier Frank Hsieh, DPP election organizer and former mayor of Kaohsiung twice tendered a verbal resignation immediately following the election, but his resignation was not accepted by President Chen until 17 January 2006 after the DPP chairmanship election had concluded. The former DPP Chairman Su Tseng-chang was appointed to replace Hsieh as premier. Hsieh and his cabinet resigned en masse on January 24 to make way for Su and his new cabinet. President Chen had offered the position of Presidential Office Secretary-General (vacated by Su) to the departing premier, but Hsieh declined and left office criticizing President Chen for his tough line on dealing with China. On 30 September 2007, Republic of China's ruling Democratic Progressive Party approved a resolution asserting a separate identity from China and called for the enactment of a new constitution for a "normal nation". It struck an accommodating tone by advocating general use of "Republic of China" as the country's name without calling for abandonment of the name Republic of China. In the national elections held in early months of 2008 the DPP won less than 25% of the seats (38.2% vote share) in the new Legislative Yuan while its presidential candidate, former Kaohsiung mayor Frank Hsieh, lost to KMT candidate Ma Ying-jeou by a wide margin (41.55% vs. 58.45%). The first months after the election were dominated by press coverage of the travails of Chen Shui-bian and his wife Wu Shu-jen. On 15 August 2008 Chen resigned from the Democratic Progressive Party and apologized thus: "Today I have to say sorry to all of the DPP members and supporters. I let everyone down, caused you humiliation and failed to meet your expectations. My acts have caused irreparable damage to the party. I love the DPP deeply and am proud of being a DPP member. To express my deepest regrets to all DPP members and supporters, I announce my withdrawal from the DPP immediately. My wife Wu Shu-jen is also withdrawing from the party." DPP Chairwoman Tsai Ing-wen followed with a public statement on behalf of the party: "In regard to Chen and his wife's decision to withdraw from the party and his desire to shoulder responsibility for his actions as well as to undergo an investigation by the party's anti-corruption committee, we respect his decision and accept it." The DPP vowed to reflect on public misgivings towards the party. Chairwoman Tsai insisted on the need for the party to remember its history, defend Republic of China's sovereignty and national security, and maintain its confidence. The party re-emerged as a voice in Republic of China's political debate when Ma's administration reached the end of its first year in office. The DPP marked the anniversary with massive rallies in Taipei and Kaohsiung. Tsai's address to the crowd in Taipei on May 17 proclaimed a "citizens' movement to protect Republic of China" seeking to "protect our democracy and protect Republic of China." On 16 January 2016, Republic of China held a general election for its presidency and for the Legislative Yuan. The DPP gained the presidential seat, with the election of Tsai Ing-wen, who received 56.12% of the votes, while her opponent Eric Chu gained 31.2%. In addition, the DPP gained a majority of the Legislative Yuan, winning 68 seats in the 113-seat legislature, up from 40 in 2012 election, thus giving them a majority (along with a coalition with the New Power Party). Programs supported by the DPP include moderate social welfare policies involving the rights of women, senior citizens, children, young people, labour, minorities, indigenous peoples, farmers, and other disadvantaged sectors of the society. Furthermore, its platform includes a legal and political order based on human rights and democracy; balanced economic and financial administration; fair and open social welfare; educational and cultural reform; independent defence and peaceful foreign policy. For these reasons, it used to be considered a party of the centre-left economically, and its base consisted largely of the working class; however, the majority of its policies are now centrist and even centre-right in nature. The party also has a social liberal stance, include support gender equality and LGBT rights, though they have a strong social conservative base, include support from the Presbyterian Church in Taiwan. The primary political axis in Taiwan involves the issue of Taiwan independence versus eventual unification with China. Although the differences tend to be portrayed in polarized terms, both major coalitions have developed modified, nuanced and often complex positions. Though opposed in the philosophical origins, the practical differences between such positions can sometimes be subtle. The current official position of the party is that the "Republic of China (Taiwan)" is an independent and sovereign country whose territory consists of Taiwan and its surrounding smaller islands and whose sovereignty derives only from the ROC citizens living in Taiwan (similar philosophy of self-determination), based on the "Resolution on Taiwan's Future" in 1999. It considers Taiwan independence to be a current fact, making a formal declaration of independence unnecessary. The DPP rejects the so-called "One China principle" defined in 1992 as the basis for official diplomatic relations with the mainland China (PRC) and advocates a Taiwanese national identity which is separate from mainland China. The DPP argues that its efforts to promote a Taiwanese national identity are merely an effort to normalize a Taiwanese identity repressed during years of authoritarian Kuomintang rule. The Democratic Progressive Party also differs from the KMT on foreign and defense policies in that the DPP considers relations with the United States, Japan, and European states, among other democratic countries, crucial for Taiwan's security. In contrast, the KMT or pan-blue coalition agrees that the Republic of China is an independent and sovereign country that is not part of the PRC, but argues that a one China principle (with different definitions across the strait) can be used as the basis for talks with China. The KMT also opposes the purposes of Taiwan independence and argues that efforts to establish a Taiwanese national identity separated from the Chinese national identity are unnecessary and needlessly provocative. Some KMT conservative officials have called efforts from DPP "anti-China" (opposing migrants from mainland China, whom DPP officials did not recognize as Taiwanese, but Chinese). At the other end of the political spectrum, the acceptance by the DPP of the symbols of the Republic of China is opposed by the Taiwan Solidarity Union. The first years of the DPP as the ruling party drew accusations from the opposition that, as a self-styled Taiwanese nationalist party, the DPP was itself inadequately sensitive to the ethnographic diversity of Taiwan's population. Where the KMT had been guilty of Chinese chauvinism, the critics charged, the DPP might offer nothing more as a remedy than Hoklo chauvinism. China has maintained a hostile position toward the DPP. It has made some efforts to moderate its tone since passing its Anti-Secession Law in 2005 to prevent a popular backlash from Taiwan's voters. In 2008 China stated it was willing to negotiate with any party in Taiwan that "accepts the so-called 1992 consensus" (The consensus agreed by KMT and CPC, which KMT described as one China principle with different definitions across the strait, CPC first recognized until 2008). The DPP denies the existence of the 1992 consensus between China and Taiwan and demand a greater democratic opening of Communist China. The deep-rooted hostility between Taiwanese aborigines and (Taiwanese) Hoklo, and the Aboriginal communities effective KMT networks contribute to Aboriginal skepticism against the DPP and the Aboriginals tendency to vote for the KMT. Aboriginals have criticized politicians for abusing the "indigenization" movement for political gains, such as aboriginal opposition to the DPP's "rectification" by recognizing the Truku for political reasons, where the Atayal and Seediq slammed the Truku for their name rectification. In 2008, the majority of mountain townships voting for Ma Ying-jeou. However, the DPP share of the Aboriginal vote has been on the increase. DPP headquarters at Huashan Business Building Level 10 in Taipei. The National Party Congress selects, for two year terms, the 30 members of the Central Executive Committee and the 11 members of the Central Review Committee. The Central Executive Committee, in turn, chooses the 10 members of the Central Standing Committee. The DPP since 2012 also has a "China Affairs Committee" to deal with Cross-Strait relations; the name caused some controversy within the party and in the Taiwan media, with critics suggesting that "Mainland Affairs Committee" or "Cross-Strait Affairs Committee" would show less of a hostile "One Country on Each Side" attitude. For many years the Democratic Progressive Party officially recognized several factions within its membership, such as the New Tide faction (新潮流系), the Formosa faction (美麗島系), the Justice Alliance faction (正義連線系) and Welfare State Alliance faction (福利國系). Each faction endorsed slightly different policies. The factions were often generationally identifiable, representing individuals who had entered the party at different times. In 2006 the party ended recognition of factions. The factions have since stated that they will comply with the resolution. However, the factions are still referred to by name in the national media. Cho Jung-tai, the Chairperson of DPP. ^ van der Horst, Linda (6 January 2016). "The Rise of Taiwan's 'Third Force'". The Diplomat. Retrieved 9 February 2018. ^ a b c d Casey, Michael (12 June 2016). "Time to Start Worrying about Taiwan". The National Interest. Retrieved 9 February 2018. ^ Shyu, Huoyan. (2008). Populism in Taiwan: The Rise of a Populist-Democratic Culture in a Democratising Society. Asian Journal of Political Science. 16. 130-150. 10.1080/02185370802204073. ^ "Hurry up: Taiwan's president has upset both business and workers". The Economist. 26 May 2018. Retrieved 25 June 2018. ^ "Tsai steps down as DPP chair after defeat in presidential poll" (14 January 2012). The China Post. Retrieved 6 April 2018. ^ Lu, Lu Hsin-hui; Kuo, Chung-han (28 September 2016). "DPP should clarify its cross-strait policy: founding member". Central News Agency. Retrieved 29 September 2016. ^ Chung, Li-hua; Chin, Jonathan (30 September 2016). "DPP members say party must discuss core values". Taipei Times. Retrieved 30 September 2016. ^ "Taiwan gets first female President as DPP sweeps election". Channel NewsAsia. Retrieved 2016-01-16. ^ Hsiao, Alison (17 Jan 2016). "ELECTIONS: DPP to control Legislative Yuan". Taipei Times. p. 6. ^ Damm, Jens (2012). "Multiculturalism in Taiwan and the Influence of Europe". In Damm, Jens; Lim, Paul (eds.). European perspectives on Taiwan. Wiesbaden: Springer VS. p. 95. ISBN 9783531943039. ^ ed. Vinding 2004, p. 220. ^ Simon 2011, p. 28. ^ "DPP vote share in Aboriginal townships". Frozen Garlic. 2014-11-30. Retrieved 2017-04-10. ^ "Taiwan president to apologize to Aboriginal people, promises law on autonomy". Nationalia (in Catalan). Retrieved 2017-04-10. ^ "China Focus: "China Affairs Committee" negative to Taiwan opposition party: Taiwan media". Taipei. Xinhua. 2012-11-22. Retrieved 2012-11-22. ^ Huang, Jewel (24 Jul 2006). "DPP votes to do away with factions". Taipei Times. p. 1. ^ Engbarth, Dennis (19 July 2010). "DPP campaign aims to bring people 'Happiness and Pride'". Taiwan News. Retrieved 30 January 2016. ^ Su, Justin; Yeh, Sophia; Wen, Kui-hsiang; Chang, S. C. (15 July 2012). "New Tide remains largest faction inside DPP". Central News Agency. Retrieved 31 January 2016.